Above: Parents of students at Abbottston Elementary School say it’s a walkable distance from their homes. 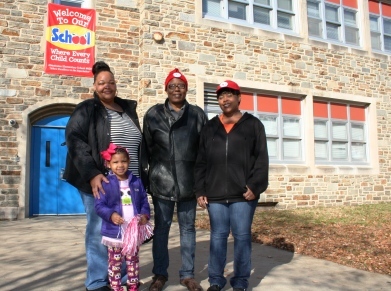 Parents and neighbors of Abbottston Elementary School protested the school’s proposed closure today, calling it a classic neighborhood school, walking distance away from families who in many cases don’t have cars. Abbottston, at 1300 Gorsuch Avenue in Waverly, is one of six schools recommended for closure by Baltimore City Public Schools in its annual portfolio review. It is slated to close in June of 2015 because of low enrollment. Councilwoman Mary Pat Clarke, who represents the district where the school is located, maintains that City Schools have the wrong numbers and that enrollment at Abbottston is actually rising. 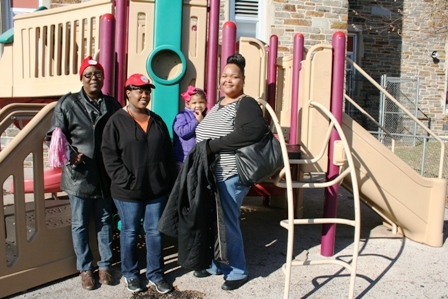 Parents say Abbottston’s principal is actively trying to get another Pre-K class. “She has the room and a teacher. She just needs to get permission from City Schools,” Clarke said. Parents who attended the protest said that Waverly Elementary/Middle is too far away and that walkable neighborhood schools, like Abbottston, are invaluable. Brandee Peterson, who has three children at Abbottston, says it is convenient and her kids are doing well there. Janice Foreman, who has a grandson in the third grade, says she graduated from Abbottson herself, and so did her daughter. “I don’t think they have crossing guards at 33rd St., do they?” she added. City Schools says rezoning Abbottston students would increase the utilization rate of the Waverly Elementary Middle building from 67% to 85%. The Greater Homewood Community Corporation, apparently, agrees. It sent a letter to the School Board and Superintendent Gregory Thornton maintaining that Waverly is not “underutilized” and protesting the possible “redrawing” of Waverly’s school zone without community engagement. Some at the meeting said Waverly parents are unhappy about the idea of taking in the Abbottston students because they fear it would jeopardize the student enrichment programs planned for Waverly. Clarke says Abbottston and Waverly Elementary parents will be on hand at the School Board public hearings tomorrow and December 9 to set the school board – and school system – straight on Abbottston and Waverly’s real numbers.